Jacob who was with us in 2014 has returned in 2015 and is sailing any time he is not sleeping and that says something as we are not sure he actually sleeps. Jacob also is the 1st mate on the Ker 50 Temptation. Jacob not Jake, but will forever be called Jake, grew up in Gaylord, Michigan. He learned to sail at age 14 out of Harbor Springs, Michigan and would bike ten miles each day to participate in the summer program there. 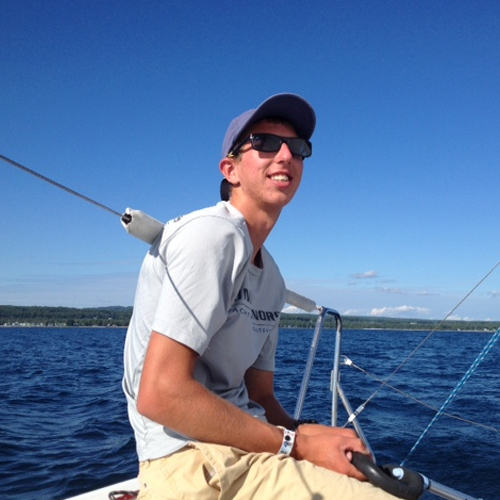 Jacob is studying Chemical Engineering at Michigan Technology University where he is also the club sailing team’s race director. Jacob’s love for discovering how things work and sailing led him to join the Oakcliff team. He hopes to use the opportunity to learn as much as he can during his time at Oakcliff. Jacob’s goal for the summer is to log several offshore miles in hopes of doing more long distance sailing in the future.